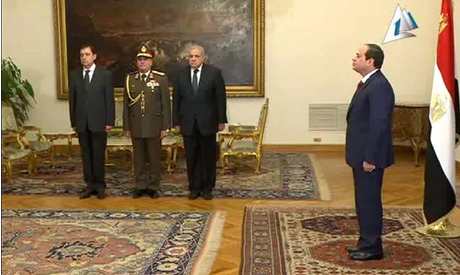 Screenshot of Egypt's President Abdel-Fattah El-Sisi during the swearing-in of new governors on Saturday 7 February 2015. Seventeen new provincial governors were sworn-in by President Abdel-Fattah El-Sisi on Saturday, most of whom are civilians in constrast with typical practice whereby appointees have military backgrounds. Most new governors are either academics, previously occupied managerial government positions, or were CEOs and managers of high profile industrial companies. Only three of the 17 new governors are from the ranks of the military: two of those are appointed in two canal cities, while another becomes governor of Matrouh, on the border with restive Libya. Two of the new governors are judges. The newcomers didn't include women or Copts, the latter a minority in Egypt. Eight of the new governors were appointed in Nile Delta governorates, while only six in Upper Egypt. There are 27 provincial governors in Egypt overall. - Hossam El-Din Imam (Daqahliya, Nile Delta): Board member and general manager of human resources at the Arab Contractors, one of the leading construction companies in the Middle East and Africa. - Ayman Mohamed Abdel-Monem (Sohag, Upper Egypt): Undersecretary of the Ministry of Health in Alexandria. - Saed Mostafa Kamel (Gharbeya, Nile Delta): Chairman of the Misr Petroleum Company and board member of Petrotrade. - Wael Mohamed Makram (Fayoum, Upper Egypt): A judge who occupied positions at the Illicit Gains Authority in Alexandria, Red Sea, Kafr El-Sheikh and Beheira. - Alaa Abu-Zeid (Matrouh, Mediterranean on western border with Libya): Former head of military intelligence of the western region. - Hany El-Messiry (Alexandria, northern Delta): CEO of IFFCO Egypt, a leading company in North Africa for edible oils and fats. Educated in California and specialising in international business, El-Messiry has also worked in managerial posts in a number of renowned companies including GSF, ABB and Bank of America. - Yasser El-Desouki Atia (Assiut, Upper Egypt): Head commercial manager in exporting company Agro Green, an Egyptian manufacturer exporting olives. - Mohamed Hefny Ibrahim (Beni Suef, Upper Egypt): A judge who occupied the position of head of the higher prosecution authority for public funds. The 38-year-old is one of the youngest Egyptian governors in history. - Mohamed Ali Sultan (Beheira, Nile Delta): A medical doctor and the head of the emergency department at the Ministry of Health. A graduate of Cairo University, he also has an academic background in hospital management and total quality management in the field of healthcare. - Hisham Younis (Menoufeyia, Nile Delta): Head of Sadat Industrial City, one of Egypt's largest industrial cities. - Mohamed El-Sayed Badr (Luxor, Upper Egypt): Head of the Information and Decision Support Centre of the Egyptian Cabinet. He is a political science graduate. - Hossam El-Din Taher (Ismailia, Suez Canal): A staff brigadier general who occupied the post of deputy governor of Cairo for the southern district. - Magdy Nasr El-Din Hassan (Port Said, Suez Canal): A retired major general who used to occupy the post of head of the General Authority for Reconstruction Projects and Agricultural Development. - Khaled Zakaria Imam (Giza, southern Nile Delta): An engineering professor at Cairo University and head of urban design and landscape architecture in the Faculty of Urban and Regional Planning. Educated at Cairo University, University of Illinois at Urbana-Champaign, University of California, Berkeley, and Texas A&M University. - Ismail Abdel-Hamid Taha (Damietta, eastern Nile Delta): An engineering university professor and deputy head of the Arab Academy for Science, Technology and Maritime Transport. - Osama Hamdy Abdel-Wahed (Kafr El-Sheikh, Nile Delta): An engineering university professor at Ain Shams University, he occupied the position of head of the construction inspection unit at the Ministry of Housing. - Reda Abdel-Salam (Sharqiya, eastern Nile Delta): Vice dean of the Faculty of Law at Mansoura University. Well done for all governors, Mr President El-Sisi wants to do the best for Egypt. So We need to give our best for Egypt and for him too. All together, we can do better. All we need to think twice before we do anything and say anything as professional do and most important thing is Egypt first before anything. Egypt have great resources when the Leader of the country and the Government put's the own interest and the nation become as one. This will work together for our benefits and our economy will will be revive. The time is coming to think of our grandchildren, as Pharaohs have done to us. May God let us see Egypt as we dream it can be. All we need to be honest and to do our jobs right. God save Egypt. Military always works defense of nation from enemies who live outside of country but looks like Egyptian military thinks that Egyptian people are real enemies and that is why they are acting as occupying power.